This post is part of the with DoubleClick series, highlighting stories and perspectives from industry leaders about how they’re succeeding with an integrated digital marketing platform. This is the second in a series of posts on real-time advertising. Last week, we wrote about the real-time gap and how access to real-time data can positively affect online sales and results. This week, we’re writing about how real-time data can help you optimize text ads and Shopping campaigns. Retailers today often have hundreds or thousands of products, but a recent study shows they only advertise an average of 49% of their inventory with search ads. There are two main reasons for this. One is that advertisers just can’t manage millions of keywords and bids on their own. The other is that they often don’t see the value of their long-tail inventory items. However, forgetting the long tail can mean missed opportunities. While each additional item advertised may not contribute a lot of sales on its own, aggregated sales for long-tail items can have a significant bottom-line impact. Our customers have told us Shopping campaigns are a critical tool to automate ad creation, management, and bid optimization. Integrating with Google Merchant Center - from feed to ad creation - helps retailers be “real-time” in responding to the many seasonal assortment changes, new product launches and inventory status changes. They can afford to traffic and manage the full product catalog, without risking losing track of a promotion or out-of-stock and paying for that “ad to nowhere”. Last year Piston saw big success with inventory management, with over 50% gains in both ROAS and conversions. Beyond expanding product coverage, advertisers can also improve performance with sound product group structure. Adaptive Shopping campaigns leverage real-time conversion data to automatically change Shopping Campaign structure to optimize performance gains. When items in product groups have similar conversion rates, DoubleClick Search can assign better bids and reduce inefficiencies in spend. By looking at advertiser data, we found, for example, that 90% of the median advertiser’s Shopping campaign cost came from only 9.5% of its products. * Often, it turned out, advertisers were lumping high-performance products into product groups with other, lower-converting products. The end result: bids that were too low for their top-selling products and bids that were too high for their lower-revenue items. A third way for retailers to increase their advertising efficiencies with real-time data is to allow them to connect their ads with product sales. Linking ads and sales used to be a complex task requiring deep analysis and a lot of data. As a result, advertisers often skipped over this analysis, missing out on key insights like which keywords sold which products. We designed Purchase detail reports to meet this customer need. In the next edition we’ll shift our focus to a real-time use case: smartphone launches. We’ll have a look at how real-time capabilities make a difference on big sales days, where competition and volatility are high. T-Mobile is one of the largest mobile providers in the US. As a cutting-edge company, it was fitting that they create a cutting-edge brand experience when it came time to showcase the powerful new Samsung Galaxy S5. The team was looking to maximize reach on mobile devices for the digital campaign. But ads built using Flash - the animation standard for many years - was a big obstacle in getting mobile reach, as the format won’t render on mobile at all. So instead of engaging with rich ads, mobile users are served a static backup image. With over 25% of all global web usage occurring on smartphones or tablets*, that's a bad experience for users, and lost opportunity for advertisers. T-Mobile, along with its agencies, Publicis Seattle and Optimedia, turned to the DoubleClick Digital Marketing platform, and built rich, engaging HTML5 creatives to solve this shortcoming. HTML5 is a universal language for display ads that ensures they render seamlessly across any screen - smartphone, tablet, or desktop. Beyond improving campaign reach, the team would no longer need to build separate creative assets for desktop and mobile, saving lots of creative time and resources. They then targeted a tech-savvy audience across devices. Optimedia was even able to target users of competing mobile providers, to entice them to switch to T-Mobile, thanks to the targeting capabilities available in DoubleClick Campaign Manager. Eliminated 85% of all instances of static mobile creatives. There was a 1.1% creative backup rate on HTML5 impressions, versus 7.3% for Flash. Mobile CTR was 400% that of desktop. The team believes this improved result was due largely to HTML5 providing a more richly engaging experience for more mobile users. Equal or better performances than Flash desktop ads in key conversion categories. Once on T-mobile.com, users who had clicked on HTML5 smartphone ads were just as likely or more likely than Flash desktop users to explore content, interact, and show intent to purchase. Lower serving fees. "HTML5 uses cloud technology, so its file sizes are much smaller than Flash," says Nelson Fortier. "This results in lower ad serving fees, saving T-Mobile valuable media dollars." 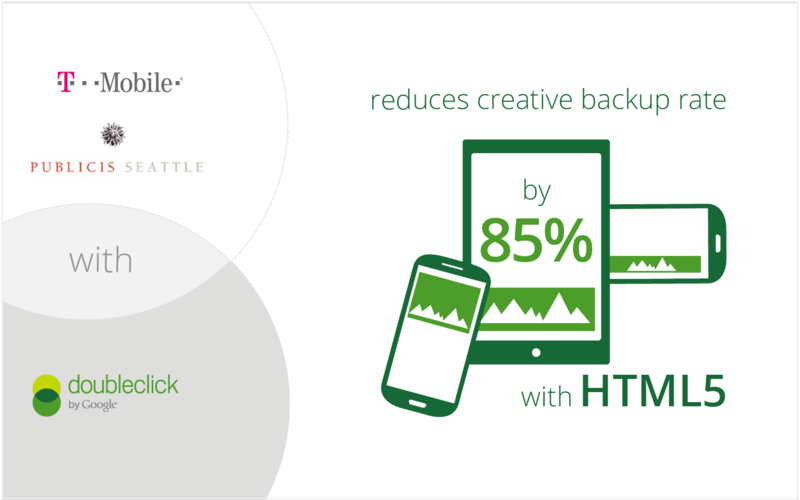 Armed with these results, T-Mobile and Publicis Seattle have begun using HTML5 for other campaigns with DoubleClick. "We saw a huge difference with HTML5 compared to similarly-targeted Flash banners," says Nelson Fortier of Publicis Seattle. "It’s compelling proof that with HTML5 and DoubleClick, T-Mobile's reach on both desktop and mobile devices far eclipsed that of Flash-based ads." To learn more about the team's approach and results, check out the full case study here. Adaptive Shopping campaigns: DS can monitor the performance of products in your Shopping campaigns and automatically subdivide existing product groups to give individual bids to the SKUs that drive most of your traffic. Product groups give a single bid to ads for all the products covered by the group, even if those products have varying performance. This feature helps you achieve better performance by automatically refining your product groups to focus on products with similar performance. You can then set manual bids or use a bid strategy to provide a bid on these groups. Learn more. Create and apply URL templates: If you use a common set of query strings or a common redirection URL for the keyword landing pages in an engine account, you can now create a URL template and apply it to your keywords. In addition to saving time and ensuring accuracy, using a URL template simplifies landing page URLs so you can quickly scan your keywords and see where they’re supposed to land. Learn more. Upload availability timestamps using bulksheets: To optimize bid strategies that target offline conversions, you can indicate which Floodlight activities track offline conversions. If no conversions have occurred for a period of time, you can use bulksheets to indicate whether the lack of data means that no conversions have occurred or that you haven’t uploaded the data yet. Learn more. Executive Reports now include a Total row in tables that display segmented data: DS will add a Total row to the bottom of the table when you create or edit a table in an executive report. The Total row is displayed if the table includes at least one segment. Watch the recorded webinar for September features to see these updates in action. 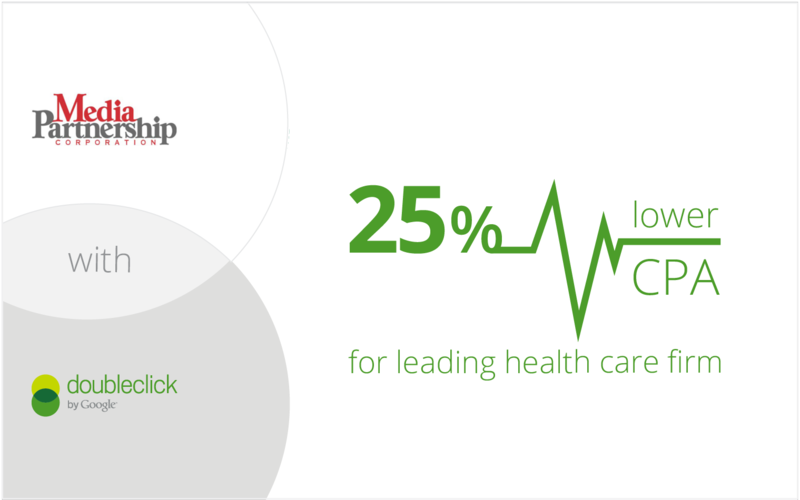 A leading health care firm turned to Media Partnership, an Interpublic Group media agency, to help them increase online health insurance applications, and better understand where to invest its digital marketing dollars. Media Partnership was already using the DoubleClick Digital Marketing platform to reach prospective customers with relevant messages across search and display. In order to make the best decisions about how to allocate budget, the team needed to understand the path of exposure across channels that led to a conversion. They began using DoubleClick attribution tools, like the Path to Conversion report. Greg Young, media strategy supervisor at Media Partnership, said, "It gave us very interesting insights into the consumer journey and allowed us to develop an understanding of how certain vendors or media executions affected the end conversion." This understanding helped the team move beyond last-click attribution, which gives all of the credit for a conversion to the last click before a conversion occurs. The team then began experimenting with the Attribution Modeling Tool to build custom models. They defined exactly how they wanted to apply different credits to different interactions, analyzed the implication on channel performance, and reallocated budget. Just three months after beginning to adjust spend and media tactics based on their attribution analysis, the team doubled the conversion rate for the campaign, resulting in many more online health insurance applications. At the same time, they were able to drive down overall CPA by 25%. Yesterday, we provided search marketers with four of our favorite tools to whip their digital strategy into shape. Today, we have five “knead to know” tips for Media Agencies to help you make your holiday promotions a piece of cake. With the right ingredients to scale and streamline your seasonal campaigns, you can find some extra time to sit back and enjoy your perfectly baked holiday pastries — while we take care of the rest. During the holidays, it’s easy to spend a lot of money—on food, gifts and decorations. But it can be hard to pull everything together to create that quintessential “holiday cheer.” This year, we have the recipe to ensure you achieve your holiday goals. DoubleClick Planning is a brand new tool that helps you simplify the planning and buying of your campaigns. The tool begins to unify programmatic and reservation inventory management, so you can carry out all of your buys in one place. Faster and more efficient cross-channel planning enables more insightful media strategies, and will ultimately help you get an ROI the size of a holiday feast. We get it. The holidays are busy, and you often find yourself running out of time—both in the kitchen and with your digital marketing. Forget the manual, hand-churned methods of the past that can leave your campaign results as stale as last year’s fruit cake. This year, turbocharge your campaigns with real-time automated bidding in DoubleClick Bid Manager. We’ll dynamically change a line item’s bid, based on the likeliness that an impression will perform well. Then we’ll use that near-instant conversion data to optimize bids throughout the day—helping you achieve specific campaign goals. And the best part? It’s all automatic, so you won’t have to make it from scratch. Knowing which product to show each viewer can be as tough as choosing what to make for Thanksgiving dinner. To ease the decision-making process, we launched support for Google Merchant Center feeds in DoubleClick Dynamic Creative. Use your existing Google Merchant Center feeds to automatically update your DoubleClick Studio or DoubleClick Bid Manager display campaigns — showing the right product to the right customers, when they’re looking to buy. In addition, retail and travel advertisers can now target dynamic campaigns to right-hand side inventory on the Facebook Exchange through DoubleClick Bid Manager. With these dynamic options on the table, the rest is gravy. As a master cook, you’re moving around non-stop during the holidays—and so are your customers. But as they’re seeking deals and checking them twice across screens, how do you drive conversions - both online and offline? Geofence targeting in DoubleClick Bid Manager will enable you to deliver highly relevant messages to customers based on their proximity to a specified chain store. This means you can maximize performance for mobile by automatically adjusting the geofence, based on privacy and potential reach. Ready to make your holidays a multiscreen event this year? We’ll raise a glass of eggnog to that! A “pinch” of this and a “dash” of that won’t get you to holiday-perfect results, especially during the busy season. With our suite of solutions, we’ll give you the precise measurements you need to cook up an impactful campaign. Ensure your campaigns are actually seen, with ActiveView on DoubleClick. Reach the right audience with comScore and Nielsen GRPs, integrated seamlessly into DoubleClick. Then, optimize your campaigns in real time using audience insights gleaned from comScore vCE in DoubleClick. By accurately measuring and optimizing your campaigns, you won’t need to wait for days or weeks to make sure your holiday dollars are spent on the right audience. Hopefully with these tips in toe, you’ll get your holiday campaigns up and running in no time, so you can enjoy some R&R with family and friends this season.